Deadvlei no doubt has some of the most dramatic lanscapes on earth. Name your preferences and requirements - we will ensure that it is professionally and efficiently handled. The only limits on your African experience are time and money - and we will work with you to ensure that your trip fit within both constraints…. Our entire reputation is built on making sure that your trip is exactly tailored to your requirements - we will take care of it all…. Your sole responsibility when travelling with us is to enjoy your African Experience to the fullest! Experience exotic and spectacular places in the Kalahari, the Namib Desert and see one of the wonders of the world at Victoria Falls, to mention but a few. We will personalize and customize a tour especially for you. 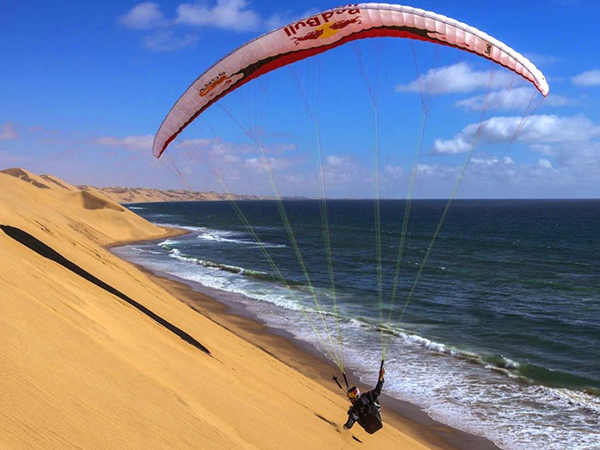 From the southern tip of Africa near Cape Town to the Skeleton Coast in Namibia, to hunting truly untouched concessions - our guides are the best there is. 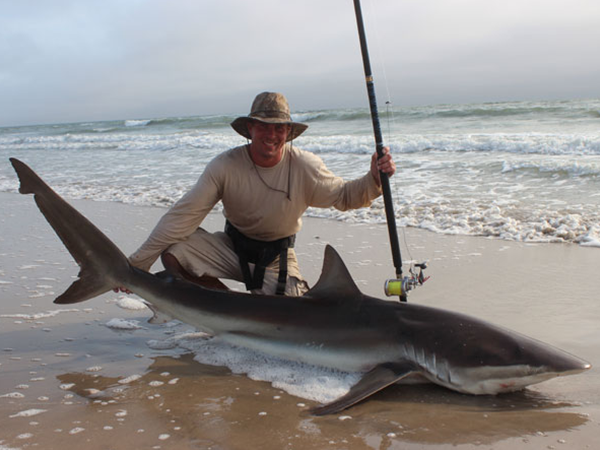 Test yourself fighting a 300lb shark on your feet, on the beach - or bait cast for a Tiger Fish, the fastest hitting fresh water fish on earth. If it can be done, it WILL be done!!! It’s a hunter’s dream-come-true and the ultimate skills test. Stalk unfamiliar game through the wildly diverse topography of Namibia and South Africa. Safaris for the active crowd!! LET THE ADRENALINE FLOW!!! From a muscle wrenching fight with a shark to a soul-searing encounter with a Tiger fish - If you are as fanatical about fishing as we are, this is for you!!! Marvel at the teeming wildlife you encounter, including the oryx (gemsbuck), springbuck, ostrich, and zebra, elephants, giraffes, hippos, rhinos, lions and other wildlife you’ve only seen in zoos. An adventure with Jaco is priceless! He will truly listen to the kind of adventure you would like to have and deliver so much more! My wife and I had an amazing off the beaten path experience with a complete stranger and left with memories of a life time, but the best of part of the whole trip was gaining a friend, who I now consider my brother. "Thank you Pieter. I just checked out the new site. Beautiful. Easy to browse. Great pictures! But, really, it's hard to express the emotions that these activities evoke. The friendliness of the people that we met. Or the memories that people will take home with them. We never tire of talking with folks about our trips. " 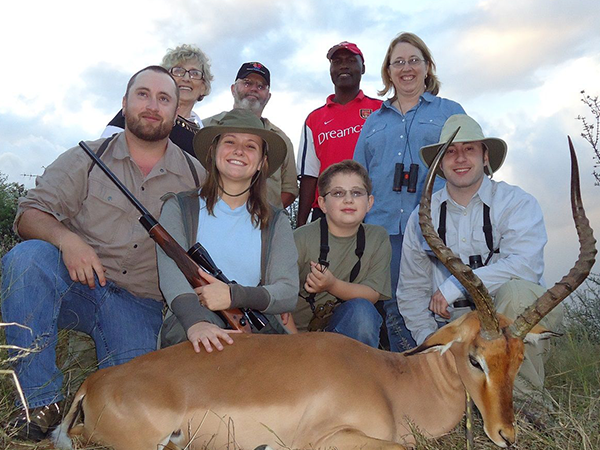 We have utilized Africa Days services for two different safaris. Not only have we had the best experiences but it has been the best way to take a vacation. I wish Africa Days could coordinate and guide all of our global vacations! "Thank you, Goign2Africa!! Not only did you fulfill my wildest expectations, but I went back a second time for more..."
"Bruce picked up his animals from the Taxidermist form the 2015 just a couple days ago. The Taxidermist he used in Minneapolis, MN, wanted to pass along a huge compliment to Ingwe Wildlife and Your Team. They said the field work, Salt Station and Ingwe Taxidermy was excellent work. A job well done." "It was the most beautiful fish I’d ever seen in my life. A bronze whaler shark weighing 250 lbs...and that was just 1 of our 6 days of adventures." "Your crew of PH's and Staff are first rate. Their abilities to see the animals, recognize them, assess their age/size and communicate with hunters all in a matter of seconds is astounding." "It was more than we ever imagined." My wife and I have travelled with Jaco for close to 5 weeks over the course of 2 trips to Namibia and Botswana. We have stayed in various accommodations, from 4 star lodges to bush camps in tents. 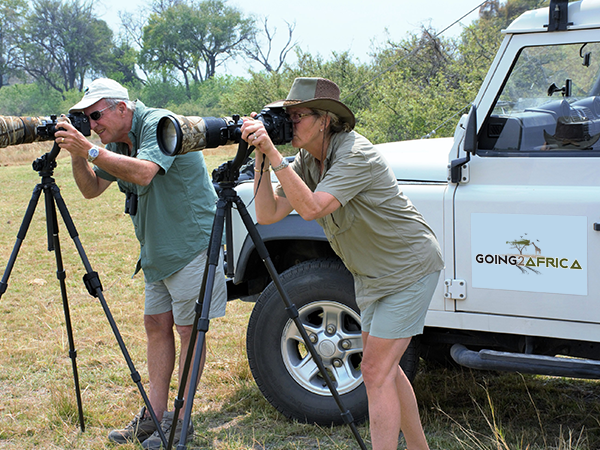 We travelled primarily to photograph wildlife. Jaco has an intimate knowledge of both countries and our travels have been absolutely superb in every respect. We were able to visit areas only a local would know about and his knowledge of the countries and wildlife is first rate. He also happens to be a great guide and good company, as well as an excellent cook. For anyone looking for an up close and personal experience travelling this part of Africa you cannot go wrong with Going2Africa. Highly recommended!! "The stunning views, the warm golden sun, the breathtaking beauty of the flora and fauna of South Africa was positively intoxicating..."